Professor Sablinsky was my dissertation advisor at the University of Virginia, and I either worked with him as a teaching assistant or grader, took one of his classes or did odd jobs for him just about every year that I was in graduate school. Sablinsky taught the very popular HIS 244, History of Russia I (to 1917), which usually enrolled 250 to 300 students. That meant that Sablinsky did the large lectures twice a week and then the teaching assistants met with students once a week. We always had a great crew of teaching assistants: Andrew Wise, Meg Trott, Ilicia Sprey, Colum Leckey, Tim Dowling, Barry Cushman, and others. Students loved the Sablinsky lectures, which were always very entertaining, and given in a kind of story-telling manner. The experience was made better, and more realistic, by Sablinsky's Russian accent. What I always found interesting was that students always seemed to be fascinated by the different belt buckles that Sablinsky wore. You don't know how many times a student would ask me about such and such a buckle. He was a very good lecturer in front of a such a large class. Sablinsky's office was in Levering Hall, upstairs, and it was filled with all kinds of Russian objects (and of course a lot of books). It was extremely interesting to sit in there, and it was always a good time when a few of us would gather up there to discuss something. While I was at UVa, Sablinsky took charge of the Russian Center and revived it. He moved it to new, more spacious digs in Levering Hall, hired staff, expanded its funding and helped to get the center back on its feet. I did a lot of odd jobs for Sablinsky over the years to earn some extra money. For example, I painted the walls of the new Russian center when it moved. I cleaned out gutters at his house. I cut grass. I painted. For years, we struggled trying to get rid of a giant bamboo forest that had encroached upon his yard. That was especially nasty business. We would cut and hack away and then take bamboo to the landfill in my pickup truck. I also worked on rebuilding one of his bathrooms. Then there was the chimney incident. Sablinsky decided that we needed to fix the cap on his chimney so that it would not leak. We got up on the roof--only one story up--and started smashing away at the concrete up there to remove it so that we could lay down some new concrete. I ended up smashing my thumb with the sledge hammer at full force, which caused an awful lot of pain, but we got the chimney fixed. Whatever the job, yard work, the bamboo, painting, hauling, etc, Sablinsky always could find something for me to do. He was very generous and always paid me well, but he was not excessive in his work requirements. 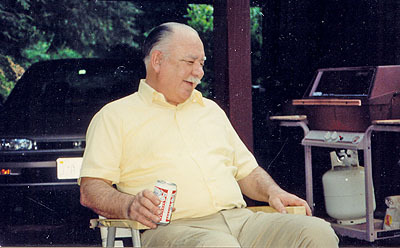 He liked to relax and always offered a beer. Once--and I know that this was not the only time--he took a bunch of us down to one of the pizza places on the corner and bought us beer and pizza--he insisted on anchovies--to watch the ACC basketball tournament. We tended to call him Uncle Vanya amongst ourselves. Well, he was my dissertation advisor, and as anyone who has graduated with a history Ph.D. can attest, that process is never a smooth one, and in my case we got it done somehow. I worked closely with the three history faculty on my committee, Sablinsky, Hammond and Schmitt, because I knew--I was absolutely sure--that anyone of them could stop my dissertation at any time if they felt that it was not up to snuff. I was very happy when it was done with only some minor adjustments that had to be made in my conclusions. Sablinsky only really published one book in his career, but what an outstanding book it was, on Bloody Sunday (see below). There is nothing that even comes close to the work and research he did on that topic. He had worked with the Columbia University White Russian émigré project so he really knew these old Russian revolutionaries. And since he was Russian, he really had an understanding of what had happened. Plus the book reads well, just as if he was lecturing on the subject, telling the story of what happened. He was truly a great guy and a lot of fun to be around and work with. I would not have gotten through grad school without his support. Two last things that I should mention. (1) He was at one time an outstanding soccer player when he was much younger. (2) He had these two Welsh corgi dogs (one was named Beaky; can't remember the other one) that were really great. Professor Sablinsky relaxing with some of his graduate students.